Despite trailing 8-0 halfway through the game, No. 23 UCF rallied back with two runs in the fifth and eight in the eighth to beat Wagner 10-8 and clinch the weekend series. The Knights (7-3, 0-0 AAC) fell behind the Seahawks (3-6, 0-0 NEC) 8-0 by the fourth inning, but came back with two runs in the fifth. They then put together a lengthy one-out rally in the eighth to come all the way back to take a 10-8 lead into the ninth. UCF picked up its first three runs of the eighth on a single from Brandon Hernandez, a wild pitch and a walk. Matthew Mika then came through with a bases-loaded two-run double to cut the deficit to 8-7. Despite the magnitude of the moment, Mika stayed calm and delivered. Dallas Beaver followed with a two-run single, bringing in Rylan Thomas and then Mika as the go-ahead run. 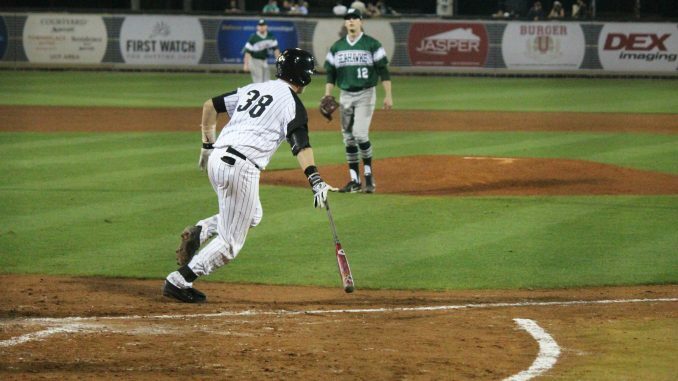 The Knights later added an insurance run thanks to a single from Jackson Webb. The big eighth-inning comeback wouldn’t have been possible without a strong relief effort from the UCF bullpen. After starter Thad Ward gave up seven runs (six earned) on six hits and three walks in 3 2/3 innings, freshman Jack Sinclair took over. He allowed a couple of inherited runners to score, but gave up just one run of his own on three hits over 2 1/3 innings. Fellow freshman Jeffrey Hakanson followed with two quick innings in which he struck out five of the six batters he faced. He earned his first collegiate victory. Once UCF took a two-run lead in the eighth, it was Bryce Tucker’s game. The preseason All-American set Wagner down 1-2-3 in the ninth to finish off the huge comeback. With the victory, the Knights clinched their second straight weekend series and extended their winning streak to six games. They will look for the sweep on Sunday afternoon before two games with No. 1 Florida next week. First pitch for Sunday’s series finale with Wagner is set for 1:00 p.m.